Bernie tell us her inspirational story of equality, difference and trailblazing. From a young age I struggled with injustice and inequality. Even though I didnt know the terminology I understood the unfairness. Its no surprise that my professional life took me on an equality fighting path. My current job is about promoting and developing social inclusion policy and practice in a local government in Ireland. I am proud to say my work in implementing the disability act in Ireland has been commended and awarded at national & international level. I am also proud to say my work has changed outcomes for those who have been marginalised and discriminated against, and I have challenged and changed attitudes for the better. I intend to continue on this path because I truly believe everyone deserves the same opportunities in life regardless of race, creed, ability and social or cultural background. My passion for equality found a new level on March 30th last year when I became a mother for the first time. My road to motherhood was a bumpy one, none bumpier than my final arrival at destination Mum. At 11.17 am on that sunny Friday morning a beautiful little girl came into my world. A bustly delivery room filled with chatter and congratulations became very quiet, hushed tones and whispering soon delivered the news "Your daughter is displaying some signs of Downs syndrome" and that was it, our world changed forever… Looking back had we known that in fact our lives had changed forever for the good. From chatting to other parents the delivery of the news of our bundle of joys diagnosis was a very positive one. 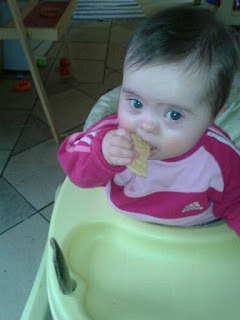 The consultant on duty told us to dismiss all thoughts and images we may have of Downs syndrome because the world had changed dramatically and that our daughter would do everything she wanted to do and the only limitations she would have were those we put on her. At the time the words were lost on us, we were in a daze, a lonely daze a confused daze and a daze of self pity. But my oh my was that consultant right. Jane or jinny as she’s known is amazing. We had decided she would be called Jinny (officially Jane) my great granny was Jane and was called Jinny and strangely my husbands granny was Jane and was called Jinny so our little bundle of fluff would be Jinny and what a Jinny she is. She is first and foremost a little girl, she is beautiful, shes is lively, she is clever, she is nosey and she just happens to have downs syndrome. Its part of her, like her huge blue eyes and cheeky smile Downs syndrome is just part of what makes her Jinny. In a short year my equality bus has acquired so so many new passengers, so many new champions of social inclusion. Family, friends & colleagues have all joined the crusade to say that difference doesn’t matter, that the world would be a very boring place if we were all the same. Jinny has brought so much to all of us, I’m not going to say it was plain sailing from day one, it wasnt we've had some tough times, it took a few wobbles and lots of tears before we realised exactly what we had, a fabulous daughter, sister, grandaughter,niece & friend. a fabulous ambassador for equality and the best reason in the world to go back to my job after maternity leave. So to anyone who has a child with Downs syndrome or any special needs you understand, to anyone about to become a parent of a child with special needs you will be ok all will be well and to everyone else celebrate difference, difference is good, we are all different. Lastly when I was young I was a bit of a performer (thank god there was no X Factor back then) but one of my favourite songs to sing was "a place in the choir"
"All gods creatures have a place in the choir, some sing lower and some sing higher, some sing out loud on a telephone wire and some just clap their hands, or paws or anything they've got"